BCS Know How is taking you through the six automatic-qualifying BCS conferences in preparation for the 2013 season. Our easy-to-digest previews continue with the Big Ten. Scroll down to see our profiles of the other conferences. The longest standing, largely unchanged vestige of the Bowl Championship Series, the USA Today Coaches’ Poll crowned Alabama as the preseason favorite to capture the final BCS title. In the final season of the BCS the Crimson Tide will begin the season as the prohibitive favorites to ride the Coaches Poll, Harris Interactive Poll and computers into the final BCS title game before the system shuts down one last time. Ohio State comes in at No. 2, taking three first-place votes to Alabama’s 58, while No. 6 Texas A&M grabs the last first-place tally. Oregon, Stanford and Georgia round out the top five. Here we investigate the preseason poll by vote share, the statistic that the BCS will use to calculate the nation’s top teams during the last eight weeks of the college football year. Update: The seventh BCS standings have been released, check them out HERE. Being down is certainly not the same as being out. If this weekend taught us anything, it should be this. Auburn and Nevada, both down double-digits in the second half, came all the way back to capture victories over conference rivals — and in Nevada’s case pulled one of the upsets of the season by beating the non-AQ darling Boise State Broncos. Add a somewhat unexpected victory by Arkansas over LSU and an entertaining edition of the Bedlam game, and rivalry weekend did not disappoint. But what does it all mean for tomorrow’s BCS standings? Well, although it won’t be anything truly drastic, changes are certainly in store. The most important developments start at the spot Boise State had been in possession of these past few weeks — No. 4. With losses by the Broncos and LSU, Stanford is in line to take over that spot. Now normally moving up two spots is not huge deal in the BCS standings if it isn’t a move into the top two spots — but in this case, its of the utmost importance. As the highest ranking team from an automatically qualifying BCS conference that will not receive its own conference’s automatic BCS bid, and ranked in the top four, Stanford would be guaranteed a BCS bowl bid. Poised to take over the next spot at No. 5, Wisconsin is also very interested in maintaining the pecking order from last weekend — as the BCS standings will be used to break a three-way tie created by the Badgers, Ohio State and Michigan State after victories on Saturday and send the winner to the Rose Bowl. With a cushion to work with, Wisconsin is likely to be ahead of the pack come tomorrow’s standings, and when the final BCS standings are released. That cushion will certainly come in handy, as Ohio State is likely to land in that No. 6 spot right behind the Badgers, likely making up some ground on the Badgers with some added support from the human side. But with no more games to be played in the Big Ten race, it’s all but over. After that it’s going to start to get a little messy. The section of the standings that was the domain of one-loss BCS conference teams is sure to be a muddled mess come tomorrow. Most importantly, that group will include Oklahoma and not Texas A&M or Oklahoma State — giving Oklahoma the Big 12 South title that it needs in order to continue its quest for a BCS bowl bid. Boise State, who was poised to take over the No. 3 spot with a victory over Nevada, will also likely be in this group, and almost certainly headed for the Boise, Idaho-hosted Humanitarian Bowl. Arkansas should lead the group of two-loss squads, with their losses coming at the hands of Auburn and Alabama, with Michigan State, Oklahoma, LSU and Missouri tagging along in that same general area. And as an added bonus, the distance between Oregon and Auburn should continue to be paper thin. With Wisconsin’s blowout 70-23 victory over Northwestern on Saturday afternoon, the Big Ten’s conference title will officially be split between the Michigan State Spartans, Wisconsin Badgers and Ohio State Buckeyes. The Badgers’ victory followed a 37-7 victory by Ohio State over Michigan and a 28-22 Michigan State win over Penn State. All three teams finish the season at 11-1 overall and 7-1 in conference. Although all three will be credited with a Big Ten conference championship for this year, only one can be named to the Rose Bowl as the “Big Ten Champion” and that tie will be broken by the BCS standings. The team which finishes the season ranked as the highest team among the three in the final BCS standings will be given the Big Ten’s automatic bid to the Rose Bowl. Last weekend, Wisconsin was the highest ranked among the three teams at No. 7. Ohio State was right behind the Badgers at No. 8 and Michigan State was at No. 10. With a few losses by top teams this weekend, the BCS standings are sure to shuffle at least slightly tomorrow, which will likely give us the clearest picture of which team will be on top come the final BCS standings. Wisconsin seems to be in the driver’s seat for the bid, however all three teams will be powerless to change their fortunes as all three are done with their seasons, and will only be able to watch the final BCS release to know their final fate. A week who’s defining characteristic was that the top three teams in the BCS were sitting at home watching the action should have spelt for a dreary Saturday in college football. And yes, the day was mostly upset free, however the penultimate weekend in November did not pass without one good upset and the threat of many more. Texas A&M pulled of the shocker of the night, beating the previously assumed Big 12 favorites Nebraska 9-6 on the power of field goals alone, to give the BCS its major shake of the week. Other teams, like Ohio State, LSU, Michigan State and Arkansas all had to work to avoid upsets of their own, but got out of the weekend with just the losses already attached to their names. So what does it all mean for tomorrow’s BCS standings? Well for the second straight week, not a whole lot, although we do have a top-ten upset to deal with following the weekend’s action. Spreads will again be affected, although not nearly as much as they were last week. Expect Boise to gain a smidgen of the gap they saw between themselves and TCU last weekend, but the distance should be about the same. LSU and Stanford should be safe at No. 5 and No. 6 even though the Tigers had a ton of trouble with Ole Miss, while Stanford cruised by California. But after that things will get a little iffy. The No. 7 spot Wisconsin has held down the past few weeks should be safe, although the Badgers’ fears about Ohio State creeping up to catch them despite a head-to-head victory will become even more straining, as its likely that the Buckeyes will be right at their heels. Of course this is important because in the event of a three-way tie for the Big Ten title, the BCS standings will act as the tiebreaker, sending the winner to the Rose Bowl as the Big Ten champs. The key to Wisconsin’s continued lead on the Buckeyes will need to be human poll support. If the Badgers falter in that area, with the relative strength of the Buckeyes’ remaining games, the Badgers could be in trouble. This week, with emphasis put on the results and the ease with which the Badgers won compared to the Buckeyes, they should do enough to stay ahead. With Ohio State already in front of Nebraska in both polls, its likely that the Buckeyes will not see the gain they might have hoped for after a victory over a top-25 opponent on the road. Expect the Buckeyes to grab Nebraska’s vacated No. 8 spot, followed rather closely by new Big 12 BCS positioner Oklahoma State, fresh of an easy victory over Kansas. Alabama, Arkansas, Michigan State and Oklahoma should all vie for spots 10-13 while staying inside the BCS eligibility bubble for this week. Without even taking a look at my BlogPoll ballot from last week I filled out my ballot for week seven. I felt like there was enough of a shakeup overall to warrant a reexamining of my ballot. Maybe fumbling my projected BCS caused me to want real change. 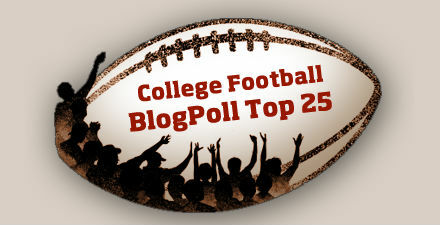 Here’s what came out the other end of my all-new looking BlogPoll ballot for week seven. Yeah, I kind of like change this weekend. Of course when Ohio State falls, it makes it easier for changes to come down the pipeline, but this week was extra ripe for the changing. So I replace the Buckeyes with the idle Oregon Ducks. Why? Well I’ve been most impressed with the Ducks this season. It’s that simple. Auburn takes a full game’s worth of viewing to really appreciate. Cam Newton is something to be seen and the Tigers can make a run at the SEC Championship this year. Non-AQ Boise State and TCU ladder up one each, followed by Oklahoma, whose win over Texas looks a whole lot nicer now, but has yet to truly inspire me. The obvious changes come next. Ohio State falls flat, Wisconsin moves ahead of the Buckeyes, but still behind Michigan State, who they of course lost to. Alabama loses a spot for losing to a pretty poor South Carolina team, which also lost last weekend. Iowa, Missouri and West Virginia impressed me enough to make an upward swing. USC Watch: The Trojans looks like Trojans of yore on Saturday in thumping California. Their only two losses have come on literal walk-off field goals. That’s painful, but not a reason to kill off their season already. Oregon is next, is another upset in store? Oklahoma State also joins the fray. I probably had them out of the poll for too long. Sorry about that Cowboys, but I couldn’t quite trust you. You’re making strides towards my trust now. The teams that left the rankings are probably pretty self-explanatory. Conference Breakdown: SEC (5), Big 12 (5), Big Ten (4), Pac-10 (4), MWC (2), WAC (2), ACC (2), Big East (1). So what do you think? Missing anyone? Giving anyone too much/too little credit? Let me know! So Alabama took a tumble, just one week after I finally broke down and put them atop my BlogPoll ballot. Who takes their spot? Well, the team that had been No. 1 in my ballots leading up to last week, Ohio State. How do the other losses affect my ballot? Firstly, I’d like to apologize to South Carolina. I was reluctant to put them in my ballot in the past few weeks, even dropping them out when they lost to Auburn, but boy did they prove me wrong. A victory over Alabama certainly changed my mind about Stephen Garcia and Co. Yes it looks lazy, but I didn’t see anything to convince me to not ladder up the teams from 2-7 after ‘Bama took the tumble. My big winners on the weekend were Oregon State, Florida State and Michigan State who beat teams that I had ranked higher than them in conference battles. Miami exits the ballot to make room for the Gamecocks, while Michigan stays, but just barely at No. 25. Arizona takes a nice nine-spot tumble and the Beavers, who I’ve been repping all season, take a nice five-spot leap. LSU beat Florida but how good are either of those teams? West Virginia the only hope for the down and out Big East? 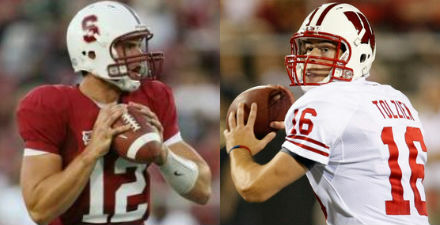 It took a last-second field goal to keep them in the ballot, but Stanford beats my Trojans in Palo Alto. USC Watch may be dead for the season. Conference Breakdown: SEC (6), Big Ten (5), Pac-10 (4), MWC (3), Big 12 (3), WAC (2), Big East (1), ACC (1).